In 2006, Rapster released the acclaimed ‘Exit Music’ album featuring adventurous new covers of Radiohead songs by artists as diverse as Sa-Ra, Matthew Herbert and Mark Ronson, whose version of ‘Just’ has endured as one of his most in-demand tracks. Au Revoir Simone, all tapping into the cryptic, expressionist core of Bowie’s originals. Bowie’s ‘Low’, one of the famed ‘Berlin Trilogy’ produced by Brian Eno, and the pre-Eno R&B and electronics of ‘Station To Station’ both loom large as an obvious root source to the machine music of 2008. “It was devoid of spirit,” said Bowie of ‘Station To Station’. “Even the love songs are detached.” Elsewhere, the new versions reference Ziggy Stardust’s cosmic glam and the cinematic low art of ‘Hunky Dory’. Even less acclaimed Bowie albums are re-visited including the ‘Labyrinth’ soundtrack from 1989 and the dramatic stylings of ‘Tonight’ from ’84. 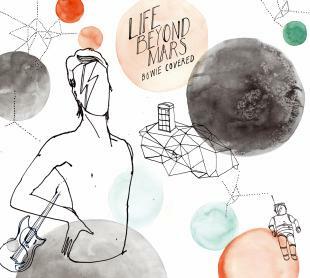 LIFE BEYOND MARS features specially commissioned illustrated artwork by Berlin artist Maria Tackmann.